I’m looking at some square wheels, 17x9 +45 offset. I would like to keep my stock oem fenders in original condition. clearance. Is this possible to fit without fender damage? fun part, I have a steep driveway which requires entry at an angle and a little suspension articulation in order to avoid scraping my front end. Sooo ....in come the various options of wide front fenders. I know there’s a few options one being Downforce. Im wondering what is the easy, durable, most cost effective option for wide front fenders? How do the various fenders incorporate the stock fender liner which I’d prefer to retain? I know, I’m asking to have my cake and to eat it too. I want the wide rubber up front 245-255. So gotta do 8.5-9 inch wheels and I don’t really like the idea of 60+ offset, just personal preference. Last edited by Tsxtx; 01-05-2019 at 06:26 PM. You really have the ideal set of staggered wheels, why the burning desire to go square? 1)Well for some reason I like to change things up somewhat irrationally. 2)I’m going to start doing track days and I’m not sure I want to chance tearing up the volks. I want the wide rubber up front 245-255. So gotta do 8.5-9 inch wheels and I don’t really like the idea of 60+ offset, just personal preference. Track wheels are going to get dirty and beat up, plus you are going to want dedicated tires for track work eventually. 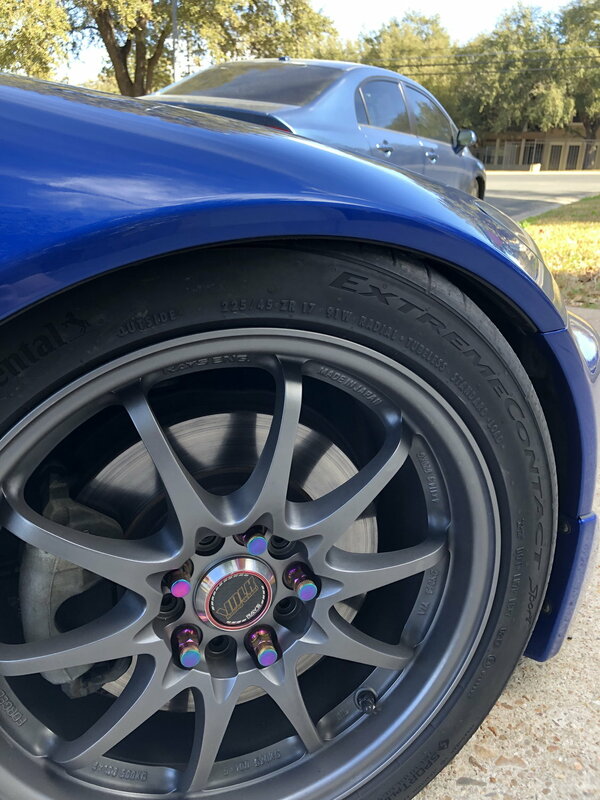 Just get some cheap TR Motorsport +63 wheels for track work. Save the bling for the street. Volks were made for the track. If you're just doing a couple of days / year then just keep them clean and keep them protected. I run a 17x9 +42 square setup with 255/40/17 and I'm still on the OEM fender and using the fenders liners. I had to roll the fenders slightly. I'm dropped on HKS SPIV coilovers on the setting that HKS setup from the factory. I still have roll to pull the fender if I want to get a more aggressive setup in the future. I can look for my alignment spec sheet if you need it. I don't think you need to get a wider fender unless you want to. You haven't had any issues on track/autox with that setup? How much negative camber are you running up front? I am running 17x9 +60 wheels on 255/40 running -3 camber and at the track/autox my tires have mangled my fender liners a little. Maybe this is because I am still on stock springs/shocks and they are soft, but I don't know. 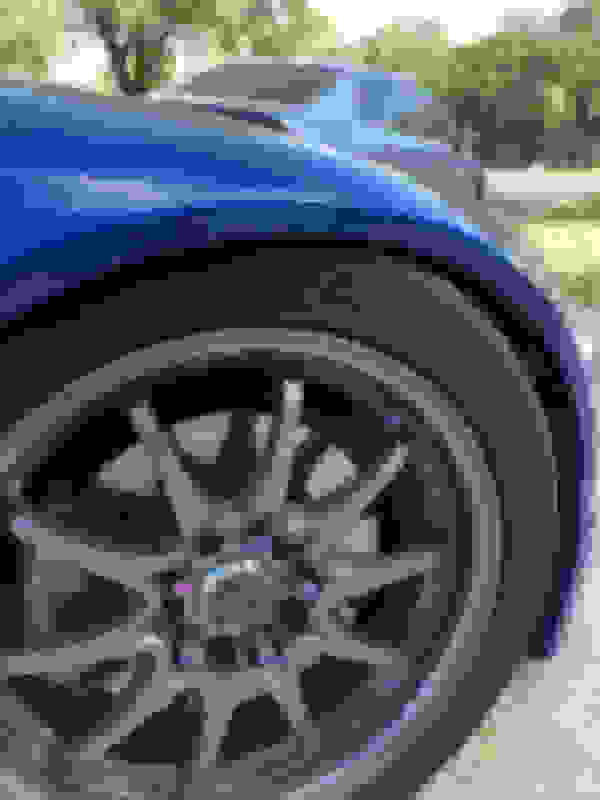 So I’m leaning towards a 17x9 +49. I’m currently on Ohlins with out of the box spring rates lowered probably an inch from stock.. I’m planning on a 245/40/17 up front and a 255/40 rear. Camber currently is only -1.5, I plan to have this adjusted to a max camber ~2.5-3. I’m also going to use the origin front upper control arm bushings which indicate an additional 7mm of increased fender clearance. Im hopefully of this being enough to net me plenty of clearance. It will be several weeks or a month before all that is put together (wheels/tires/bushings). I’ll report back once that happens.